10 students worked through a range of activities with Ms Unwin in Monday’s session of The Great Outdoors. The day was organised around a series of challenges incorporating English, Science, Art, Music and DT. With each challenge students were asked to change partners to extend their social and communication skills. After kitting up against a damp start, Bivouacs were put up, tools sharpened, followed by 2 sessions of natural shelter building, refreshments, a first aid discussion, making a kazoo, wooden box stomping to make tinder, lighting the Kelly Kettles safely and enjoying a hot chocolate or cup of tea were all achieved before lunch. In the afternoon the group enjoyed a hot dog before discussing the concept of camouflage in nature. Having used camouflage paint on their faces and gilets decorated with leaves to break up their outline, they played predator v prey, which proved so popular students elected to do it twice through. Finally, strawberries were collected from the garden and eaten with ice cream before students completed plenary sheets about the day’s events. 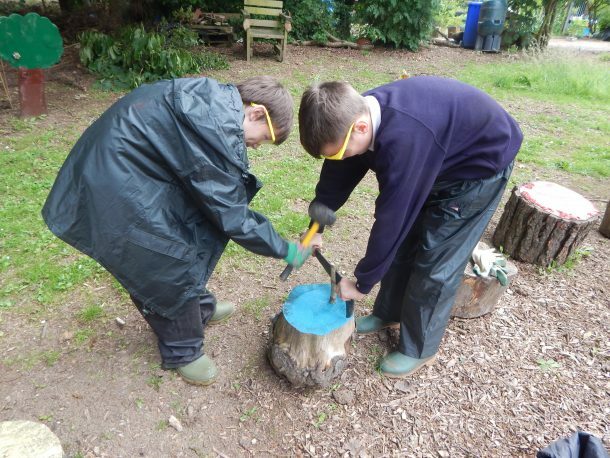 Ms Unwin will be working with 3 other groups during the week – A gardening experience with Ms Taylor’s Science group on Tuesday, Wild Woodland on Wednesday and Alfresco cooking on Thursday.